Knowing core survival foods is a key to wilderness survival. Though humans can survive for up to three weeks without food, we probably wouldn't choose to go that long. Most natural environments are filled with a variety of items that can meet our nutritional needs. Plants can often provide the most readily available foods, though insects and small wild game can also support our dietary needs in a survival situation. 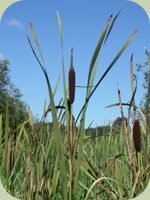 Cattails are known as the "supermarket of the swamp", as no matter which season it is, there are always edible parts available on the cattail plant. The roots, shoots, and pollen heads can be eaten. The inner bark of conifers, know as the cambium layer, is full of sugars, starches and calories. It can be eaten on most evergreen, cone-bearing trees [except for yew, identified by its red berries, in which all parts are poisonous]. The inner bark should be scraped out and cooked to convert the fibers into a more digestible form. All grasses are edible. The leaves can be chewed and the juices swallowed - though be sure to spit out the un-digestable fibers. Where the base of the leaves meet the root is a small white part of the stem/root structure, called the root corm. It can be roasted and eaten like a potato. All acorns, the nuts produced by oak trees, can be leached of their bitter tannic acids, and then eaten, providing an excellent source of protein, fats, and calories. The acorns can be placed in a net bag in a stream for a day or put into several changes of boiling water to extract the tannins. White oaks have the least amount of tannins and therefore the best flavor. Be sure to properly identify any plant you plan on consuming (using field guides and/or the guidance of an experienced naturalist). Many plants can be difficult to identify and some edible plants have deadly poisonous look-alikes. If you cannot identify the plant, do not eat it. Ants, grubs, and grasshoppers can be eaten. A good way to get over our natural resistance to eating bugs is to toss them into a stew with other ingredients. All freshwater fish in North America are edible. In a survival situation, fish can be caught using a sharpened stick as a fish spear. For small minnows, a t-shirt can be used as a fish net. All birds are also edible. Game birds such as grouse and pheasants can be captured using snares or hunting implements such as a throwing stick, though it can be very difficult if you have not practiced these trapping/hunting skills. In the spring, bird eggs can provide an excellent survival food. Small mammals including squirrels and rabbits can also be captured with practice. Traps and snares are often most effective, though a throwing stick can used too. Especially when it comes to wild foods, the more you know about nature, the better you will be able to locate and obtain sustenance. For example, wildlife tracking skills enable you to effectively locate wild game for food. Knowledge of plant identification can help you find a variety of wild edibles to eat. 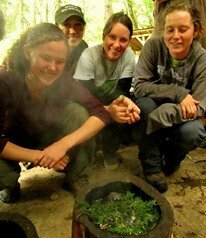 Purchasing a quality wild edible field guide is a great next step to learning more about survival foods.